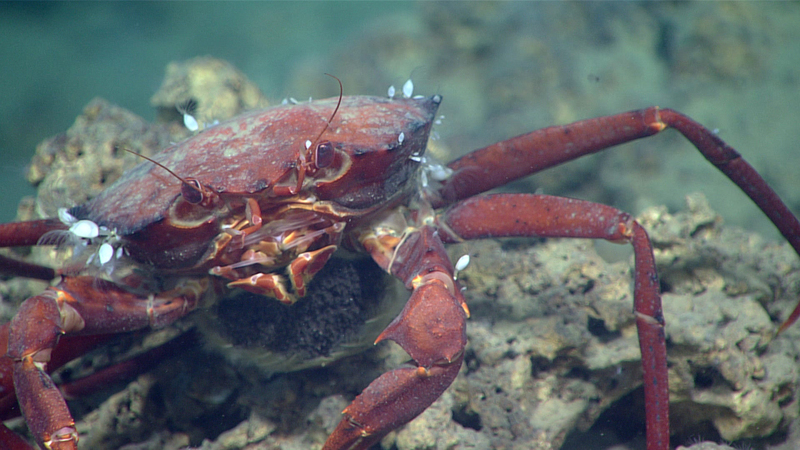 A red crab sits on a piece of carbonate near a methane seep. The crab is laden with eggs, which are visible on her underside. Image courtesy of the NOAA Office of Ocean Exploration and Research, Gulf of Mexico 2017. Download larger version (jpg, 876 KB). Deep Discoverer encountered several of these depressions or pockmarks that are likely associated with the release of methane from the seafloor. Image courtesy of the NOAA Office of Ocean Exploration and Research, Gulf of Mexico 2017. Download larger version (jpg, 929 KB). 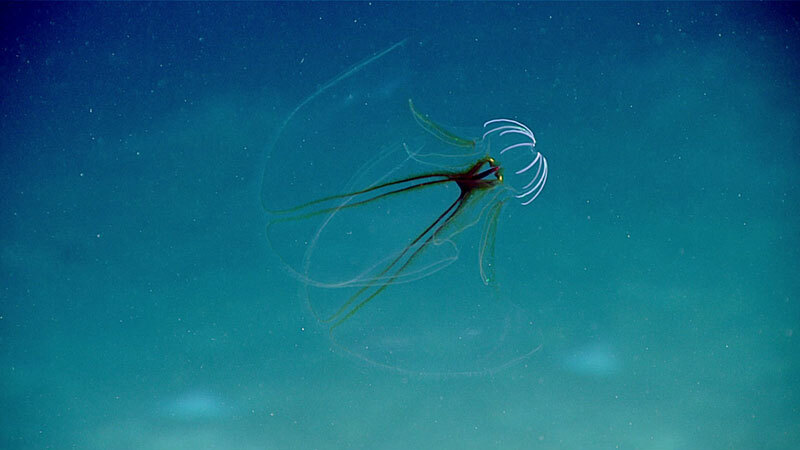 Deep Discoverer encountered this unusual ctenophore swimming above the seafloor. Image courtesy of the NOAA Office of Ocean Exploration and Research, Gulf of Mexico 2017. Download larger version (jpg, 744 KB). During the final dive of the expedition, Deep Discoverer encountered gas hydrate mounds, ice worms, chemosynthetic communities, and active gas seeps. In this video, you can see droplets of methane coming out of the seafloor that are that encased with methane hydrate. Video courtesy of the NOAA Office of Ocean Exploration and Research, Gulf of Mexico 2017. Download larger version (mp4, 26.26 MB). Throughout the dive at ‘Horne Dome,’ Deep Discoverer traversed areas of hydrocarbon seepage (discovered at water-column bubble targets) and sedimented seafloor between 1,053 to 1,074 meters (3,455 to 3,524 feet) depth. The site featured four previously undiscovered methane seeps, most of which were were associated with small sedimented mounds suspected to contain methane hydrate. Some of these features also had authigenic carbonate outcrops. Methane-bubble streams were observed at every site, with methane hydrate forming where bubbles were leaving the seafloor or under overhangs. The hydrate was yellow in color, indicating impurities in the gas hydrate or an oily coating on the surface of the hydrate, something that has been seen in other parts of the Gulf of Mexico. We observed ice worms (Hesiocaeca methanicola) in depressions on the hydrates. All of the seeps had small associated chemosynthetic communities, which differed from those observed during other dives on this expedition, being comprised of live and dead vesicomyid clams partially buried within the sediment and many eelpouts resting on the seafloor. Bacterial mats, blackened reduced sediment and tubeworms (Lamellibrachia sp.) with zoanthids growing on the tubes were also common. We observed two kinds of gastropods, Kanoia meroglypta and Phymorhynchus sp., fringing blackened sediment and white bacterial mats. Some of these K. meroglypta hosted juvenile Bathymodiolus mussels, which were also seen on nearby carbonates. 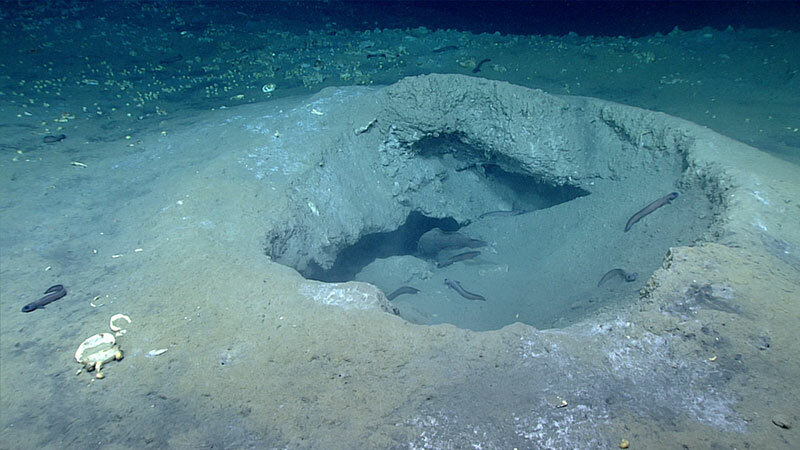 One of the chemosynthetic communities was found in a pockmark-like feature, perhaps a collapsed methane-hydrate mound. The last seep had a slightly different faunal assemblage in that it also included adult Bathymodiolus sp. mussels and many chitons (Leptochiton micropustulosus).